FAIRFIELD - At the start of every inning, just like he’s done in every game that his son, Ethan, has played in over the past eight years, his father, Jason Takacs, pushes Ethan’s wheelchair out to home plate and sets a wonderful and emotional dance in motion. The pitcher throws a pitch, the batter, one of Ethan’s teammates, swings and then Jason takes off, with another teammate helping to push, as Ethan makes his way around the bases while players on both sides - and parents all around the field - applaud. This has been done, every inning of every game, since Ethan was four years old. Ethan Takacs is a quadriplegic but that hasn’t stopped him from enjoying the game he loves. 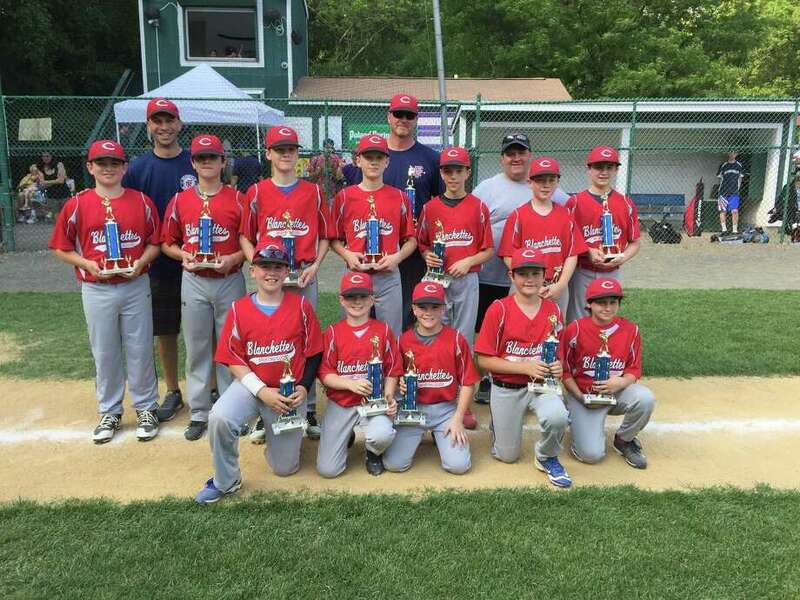 Last Saturday, Ethan’s team, Orangetheory Fitness, took on Garden Catering for the AAA championship in the Fairfield National Little League at Tunxis Hill Park. Thanks to Henry Vincent’s two-run double and Ethan’s brother Brady, who scored two runs, hit a double and threw three innings of scoreless relief, Orangetheory Fitness posted a 7-5 victory - one of three spring championships on the day as Lesko-Poke Funeral Home defeated Nestle-Pure Life 6-4 to win the AA title and Blanchette’s Sporting Goods bested L&L Ever-Green 3-1 to win the Majors crown. It was the first time that Fairfield National had held all three of its championships on the same day at the same field. The AA championship started at 9 a.m., the AAA Championship started at noon and the Majors championship started at 3 p.m. In-between, there was a home run derby from each of the leagues. Ethan went around the bases six times over the course of the game as Orangetheory Fitness and Garden Catering went back and forth, exchanging the lead. Garden Catering led 1-0 in the first, only to see Orange Theory score two in the second and two in the third to take a 4-1 lead. Garden scored four runs in the third to regain a 5-4 lead but Orange Theory rallied with three runs to win the title. While he may not be able to run the bases or swing a bat, that hasn’t stopped Ethan - a die-hard Yankees fan - from participating in the game he loves. And it’s a testament to the league and the players to make Ethan feels like he truly belongs. According to Schopps, there are over 40 teams and 500 kids involved in the Fairfield National Little League, from T-ball to Majors. The league starts in early April and goes into June with Fairfield National now getting its summer All-Star teams together, as for the Majors (12- to 13-year olds) the road to Williamport and the Little League World Series is about to begin. Even better than the participation is the support. There are over 40 local sponsors helping the league, from sponsoring teams and donating uniforms, to advertising signage across the outfield fence. In the Majors game, L&L and Blanchette’s were scoreless over the first four innings before Blanchette’s took a 2-0 in the fifth. In the sixth, a solo home run from Will Stellato pushed the lead to 3-0 before L&L notched a run to make it 3-1 but that would be it. And a great day overall for Fairfield National. Team members for Lesko & Poke include: Ben Acquaviva, Gavin Brewster, Daniel Calandriello, Crew Davis, Alex DeLuca, Thomas Deems, Sam Haufe, Alexander Lau, James McGuire, Barrett Mullahy, Finnian Mullahy and Andrew Robilotto. Manager Steve Robilotto, coach Chris DeLuca, coach Jon Haufe. Team members for Nestle Pure Life include: Will Barmash, Ryan Campbell, Nicholas Crosley, Brendan Deigan, James DellaVolpe, Carlo Desy, Lucas Harmony, Grayson Lalumiere, Gabriel Pestka, Henry Quinn, Andrew Shelove and Colin Stowell. Manager James Quinn, coach Marc Desy, coach Kevin Lalumiere, coach Geoff Stowell.